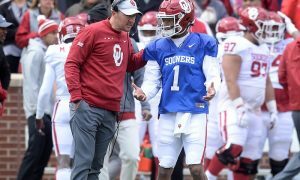 Due to weather concerns, Oklahoma decided to move its spring game from Saturday afternoon to Friday night under the lights (Thank you, OU, because nearly every other Big 12 team is hosting theirs on Saturday, which makes our coverage difficult). Before the game began, Oklahoma had country singer Lee Brice perform and while they may have shelled out $150,000 for him (Yikes), there was still a solid turnout once again for the game. Former players, coaches and fans showed up and from my livestream (It wasn’t on TV), it looked like a fun night atmosphere. 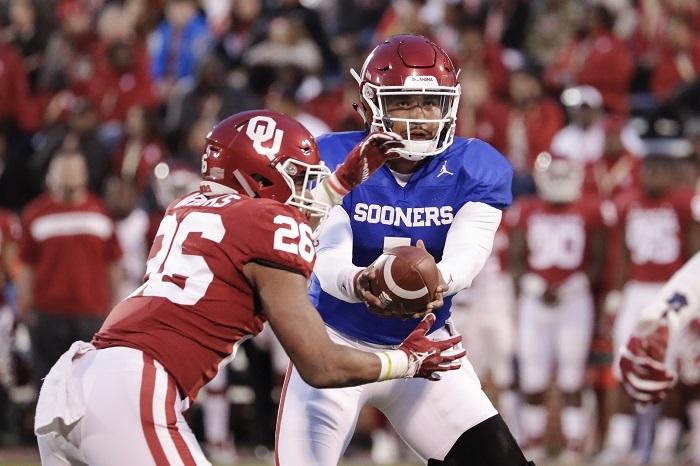 The game was split up into two halves (One 20-minute half and one 15-minute half) and had the Red team led by quarterback Jalen Hurts taking on the white team led by quarterback Tanner Mordecai. There was plenty to takeaway (even though it’s just a spring game) from Friday night as the Red team won 35-14. Instead of a traditional recap, I thought it would be more fun and interesting to take away a few things from the game and share them. 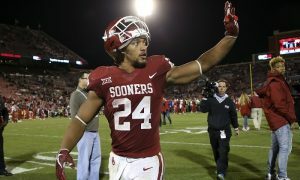 I am not the type of guy to take everything from a spring game to heart, but what I saw on Friday night was clear: Jalen Hurts is the starter and it’s not even close no matter how much Lincoln Riley says it’s a “competition”. Hurts was able to lead two touchdown drives (out of four total drives) in the first half. He started off the game with a nice run before hitting freshman wide out Trejan Bridges for a big first down on third and long. Hurts looked comfortable running the offense and the pace of the offense didn’t phase him one bit. He made some nice scrambles inside and outside the tackles along with showing some touch on his passes. Jalen wasn’t perfect but what he showed to me is that he is more than capable of keeping this Sooner offense running strong. The big question will still be his arm, but I really liked what I saw from him on Friday. On the other hand, you have redshirt freshman Tanner Mordecai, who had a rough game. The offensive line gave him time, but he was unable to really get anything going for the white team. He had a few balls batted down and skipped a few passes to open receivers as well. Not to mention, what should have been a pick six if they didn’t call Justin Broiles down before he scored. Whether he was inside or outside the pocket, he never looked comfortable out there. In fact, I tweeted out that walk-on third string quarterback Tanner Schafer looked better than Mordecai. Even if you are not a recruiting junkie, you still must like what you saw from most of these young guys. Freshman pass catchers Trejan Bridges, Theo Wease and Austin Stogner (TE) looked very good out there as well as redshirt freshman Jaqualyn Crawford. All of them had multiple catches and Theo Wease had a couple late touchdown grabs. Trejan Bridges had some of catches that made you say “Wow”. I mentioned earlier that he had a key grab on third and long early in the game that set up a score and he even had another one in the second half to set up another score. Of course, I can’t forget about Crawford who looked very explosive and should be a key contributor this upcoming season. Lastly is the jack of all trades, tight end Austin Stogner. Many weren’t sure of how he would look or if he would be ready but after tonight, he looked damn good. With some added weight from the weight room, Austin could be a superstar down the road. Overall, this group impressed the hell out of me and even though they all came in highly rated, it appears to me that they will meet expectations. To nobody’s surprise, it was hard to grasp any true takeaway defensively. There were a few plays here and there that were good but overall, I thought the defensive line didn’t get as much pressure on the quarterback as I would like to see. Linebacker Bryan Mead was all over the field in the first half and if there was a defensive MVP it would likely go to him or Justin Broiles who got robbed of a pick six because they called him down on the return. The defensive units could have played better (Especially on the white team), but like I said earlier, it’s hard to take away too much anything here defensively. Much like the whole “Can Jalen Hurts be effective throwing the football?” argument the “How much better can the defense get under Alex Grinch?” question won’t truly be answered until August 31st when they take on Houston.